When it comes to creating the perfect tone, most people typically think it all has to do with the guitar, or the amp, or the pedals. But one thing that tends to get overlooked is the guitar pick. This small, inexpensive tool has such an impact on your sound and playing, but it tends to be one of the last things that guitarists think of changing. With all options of guitar pick thicknesses, size, shape, and materials, it can be a lot to take in. We threw together this handy guide to help you pick the perfect guitar pick. When most people think of a guitar pick, this is what they picture. That’s because these are the most common types of picks out there. Celluloid picks have a bright, crisp attack but they aren’t very durable. They also tend to have a “flappy” sound to them from them being so flexible. Whether that’s a good thing or not is totally up to you. Some players like Gene Simmons and Jimmy Page swear by nylon picks. These have a bright sound and tend to be pretty flexible. Most of them come with textures on them as well to help improve the grip, which is just what you’ll need when you’re hands get sweaty from doing too many Pete Townshend-style windmills. 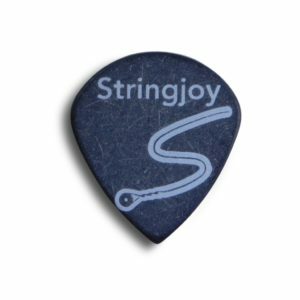 Your Stringjoy, Tortex, and Delrin picks are made out of this highly durable plastic. Companies started making picks out of these materials once it became illegal to make tortoise shell picks in 1973. These are going to be more stiff than the nylon picks, but less stiff that ultem picks. These are a great choice if you’re just starting out and are looking for something thats durable but also has a strong attack. Picks made of this, like the Dunlop Ultex picks, are super stiff no matter the thickness and they produce a bright tone. While guitarists use these, they have become very popular among mandolin players. These have been around since the 80s and are a tough, light, and can be molded to almost any thickness. Plus they’re usually clear, so they look super rad. The thickness of your pick will play the biggest part in how bright or how warm your guitar sounds. As with everything, the different options for guitar pick thickness each have their own pros and cons. Your thin picks are usually going to range anywhere from .40 to .60 mm. These will have a lighter sound, naturally, and work best for delicate playing. Thin picks, especially ones made of celluloid, will produce that “flappy” sound that I was talking about earlier. 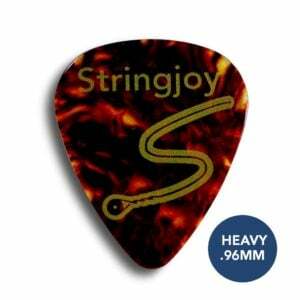 They are great for acoustic strumming and other times where you want that bright and defined rhythm tone that you hear in so many rock and country albums. Thin picks aren’t going to be good for lead playing because they don’t have that well-rounded tone needed for single-note leads. These are going to be too bright for lead playing since they don’t provide much of a low-end. You also tend to have a loss of control due to the extreme flexibility of thin picks. Medium Picks are going to range in thickness from .60 to .80 mm. Medium thickness picks are the most popular choice among guitarists. While they may not provide that same shimmer on acoustic strumming that thin picks do, medium picks still have enough flexibility for good rhythm playing while still retaining the stiffness needed for those leads. They have a nice high-end and mid-range to them without having the boominess of heavier picks. Beginners tend to start here because its a nice middle ground. Picks that are .80 – 1.2 mm are considered heavy. These are going to provide you with the most control when it comes to your playing. Heavy picks will help to clean up your playing, provide less pick noise, and help your solos to become more dynamic. Long story short, If you’re normally playing lead guitar, this is the thickness of pick you’ll want to play. For those players that need an even HEAVIER pick, you should look into extra heavy guitar picks. These are considered 1.2 mm and higher. The players that use these are usually bebop and jazz guitarists looking for a super warm, mellow sound. Our friends at Gravity Guitar Picks make some that go up to 6 mm (thats the about same thickness as three nickels stacked on top of each other). I’m personally not a fan of picks that thick, but if you’ve never tried playing something thats 3 mm or higher, I’d recommend giving it a try! Shape also plays an important part when finding the perfect guitar pick for you. The guitar pick’s shape will affect how easy it is to hold and how precise you’ll be able to be with your picking. These are the picks that most guitarists start with. Many end up staying with these, and for good reason. They are the tried and true pick shape. If you’re not sure what to use, these guys will never let you down. These tend to be a favorite among acoustic and bass players due to their easy-to-grip size and the blunter tip providing a warmer sound. They can even be used on all three corners so if one wears down, just rotate it and keep on rockin’. While these are called “Jazz”, they can really be used with any genre that requires fast, nimble picking. If you’re used to playing a larger pick, such as a classic or a tri-tip, these will speed up your playing immensely. These are the hybrid between the jazz and the classic picks. They provide the speed and precision of jazz picks but the larger size of classic picks. 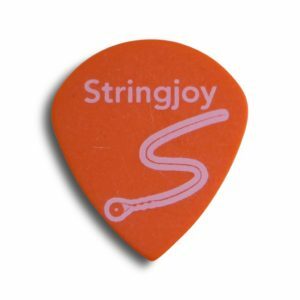 You know that Scott guy who owns Stringjoy? These are his favorite pick to play with. It’s really comes down to your personal preference when using a textured guitar pick. I tend to like having the extra grippiness (I think that’s a word?) 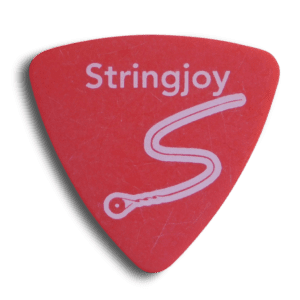 that comes with using a textured pick, but I know plenty of guitarists who just want a nice, even surface to hold on to and would rather use their teeth than play with a textured pick. 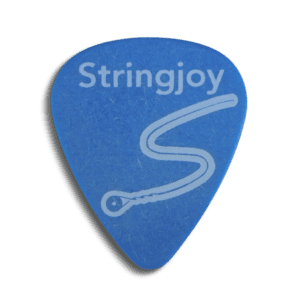 When it comes to nylon picks, however, these are usually going to come with a textured surface since nylon tends to be pretty slippery and no one wants their pick flying out into the audience mid-solo. Trust us on that one. Some players, like The Edge, have been known to use textured picks, but flip them around so that the textured side is actually helping to pluck the strings. He’s used this technique a lot in this career, since I knew you were wondering how he got that extra crispiness on “Where the Streets Have No Names”. The most important thing to keep in mind when choosing the perfect pick for you is to keep experimenting until you find something you like. There are no right or wrong answers! Find out what works best for you, and buy a boat load of ’em, because we all know that guitar picks disappear way easier than they should. If you’re looking to try something new, or stock up on an old favorite, head over to our shop and we’ll get you all set up. 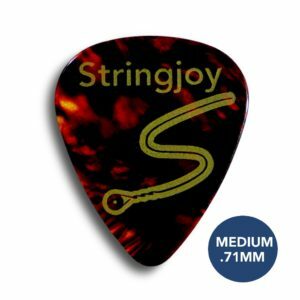 I love playing rock and metal, I use standard picks with 1.14mm and 1.5mm, is there a better size for that kind of music? Also is there a certain pick shape I should look out for, I use standard shape. I love the Dunlop Ultex Sharp picks. 1.0 and 1.14 are both good. They are very stiff picks, and they have pointy tips. Feels really precise to me. Hey Brian! I'm afraid we don't make anything like that currently. Do you carry dulcimer strings? Also what picks do you recommend? Hi Marsha, we don't carry dulcimer strings right now, sorry! As for picks, typically something with a sharp edge like our Jumbo Jazz or Jazz would be best for Dulcimer as far as I know, but I'm not the expert in that world.